There is a cemetery in Worcester, Massachusetts called Hope Cemetery. It is a beautiful place filled with ancient trees, impressive monuments and mausoleums. It also serves as a place of refuge for many different types of flora and fauna, including myself. My family says I spend more time in this incongruously named location than I do at home. Shortly before Memorial Day last I came to enjoy the beauty of the flowering shrubs and fruit trees. As I walked past the White family plot I received the equivalent of a "PSSSST!" from beyond the grave. The flags had recently been placed on the graves of veterans in anticipation of the Memorial Day events. As I walked up to the White family's eternal home I noticed the grave of John White Jr. 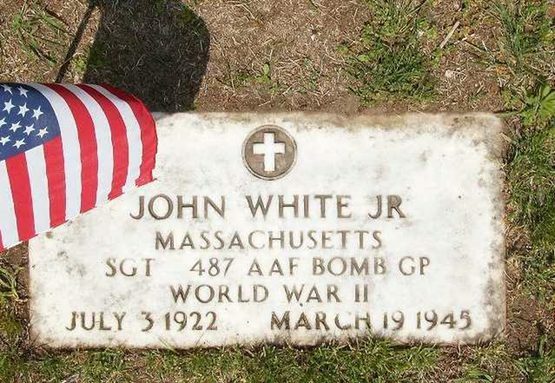 The plain, white, marble plaque simply said: John White Jr., Massachusetts, SGT 487 AAF Bomb GP, World War II, July 3, 1922 ­ March 19, 1945. As I stood amidst the sea of flags gently flapping in the breeze I couldn't help but notice that John had been forgotten. There was no flag on his grave. My first thought was that it was awful that he had gotten all the way through the war only to die weeks before the end of hostilities. My second thought was essentially, "What does a dead person have to do to get a flag around here." I assumed that I had been called over in order to find whomever I needed to in order to obtain a flag for John. I searched the cemetery and found the ROTC personnel and students who were placing the flags. I explained the situation and convinced them to give me a flag for John. I placed it on his grave. Assuming that my work was done I turned to leave, but was then informed that there was something else that needed to be done. As I stood there looking at John's grave I got a vision of B-17 Bombers over Germany. I heard a voice say, "There was a big explosion. The other guys bailed out." I knew by this point in the war the Luftwaffe had been decimated. I also knew that there was still plenty of triple A (anti-aircraft artillery) so I thought that John's plane must have met its demise in this way. In any case, I have to admit that at this point my interest was piqued and I decided to go home and research the 487th Bomb Group online and see if I could find anything about John White and what had happened to him. I was surprised to find that the 487th Bomb Group had a website. Unfortunately the only thing about John on the site was the fact that he was killed in action and the date. I decided to email the webmaster to ask him if he had any additional information. I also told him that I had found John White without a Memorial Day flag and that I had provided one for him. The next day I received an email in response to my request. The webmaster was the son of a now deceased member of the 487th. He wrote to give me a brief bit of info about John and to tell me that he had written to a man who could provide additional. Several days later I received an email that told the story of what happened to John White and included a photo of John and his other crew members shortly before they were killed. This is what I was told by the people at the 487th Bomb Group's website. John White Jr. was born in Maine in 1921. He completed four years of high school. His civilian job was managerial. He lived in Worcester County, Massachusetts, and was single, without dependents. He enlisted in the U.S. Army as a Private at Fort Devens, Massachusetts, on 28 September 1942. His Army Serial Number was 31183916. He was the Engineer on the Daniel C. Smoke Jr. crew in the 838th Bomb Squadron, 487th Bomb Group. This crew arrived at Lavenham, England, on 26 February 1945. On 19 March 1945, Lt. Smoke's crew flew B-17G 43-38038 with the 836th Squadron on the mission to Zwickau, Germany. During formation assembly, at 15,500 feet over Clastres, France, Lt Smoke's B-17 collided with Lt John R. Virgin's B-17G 43-37969. All of Lt Virgin's crew bailed out and survived. None of Lt. Smoke's crew was able to bail out, and all nine were killed in the subsequent crash near Couvron, France. This is the picture of John White Jr. and the rest of Lt. Smoke's crew. The email response from the 487th Bomb Group's webmaster also requested that I provide a photograph of John White's grave site. The Tuesday after Memorial Day I went to Hope Cemetery with my 16 year old niece Amanda. I do not have a digital camera and needed her to come so I could borrow her camera. We took the photo and started to drive out of the cemetery. My niece turned on the radio and tuned it to the college radio station for Holy Cross College. They play a fairly eclectic assortment of rock music mostly punk rock. The song that was playing finished as we approached the gate of Hope Cemetery. Then something happened that really seemed beyond all probability. The song "I'll be seeing you", a song well known to most service members during WWII started to play on the radio. I looked at my niece with my mouth open in shock, the hair stood up on my arms and the back of my neck. The song played in its entirety and we bawled like babies all the way home. As someone who clearly understands the way in which meaningful coincidences are used as a form of communication by those who have passed over, I can only see this song as a thank you from John White. A thank you for the flag and for reconnecting him with his still surviving buddies who had no idea where he had been interred. I send my kindest regards to all of the men and women who are currently serving in our armed forces, and especially to those members who have made the ultimate sacrifice. This is the picture of John White Jr.'s headstone. It can also be viewed at this link http://www.487thbg.org/Photos/WhiteJ.shtml which will allow access to other information about the 487th Bomb Group.